Labun Residents Emigration Ports, 1899-1935. 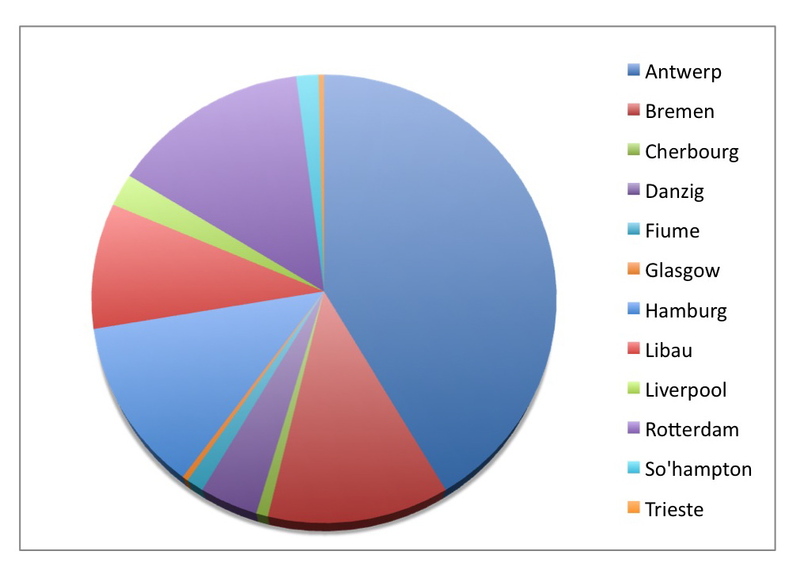 The pie chart and its key to ports are best read clockwise starting with the large slice for Antwerp on the right side. During the early years of emigration most emigrants went to the port cities of Rotterdam or Hamburg for departure. Initally the Lubiners started using Antwerp in about 1906. After WWI, Antwerp clearly monopolized the emigrant traffic with Danzig and Bremen far behind. Labun Emigrants who left for the United States between 1899 and 1935. Data derived from manifests for the ports of New York, Boston, Baltimore and Philadelphia. The earliest migration from Labun to the United States that we have been able to confirm, thus far, occured in 1899. [Our difficulty in confirming Labun origins for these early passengers is due to the fact that manifests from this early period did not require the same level of information that post-1906 ones did.] There was a steady trickle of emigration and some growth in numbers peaking in 1910 and 1914. During World War I and the Russian Revolution immigration stopped. It resumed with some ferosity in 1921 when 69 individuals left Labun for the United States. The Immigration Act, passed by the US Congress and signed into law in 1924, effectively ended mass migrations. Ellis Island changed from an immigrant processing center to one for detention and deportation.